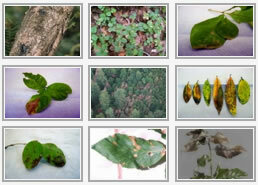 Below are resources useful when addressing or managing P. ramorum or Sudden Oak Death in forests and wildlands. For specific Forestry Information, click here. National Framework for Managing Sudden Oak Death caused by Phytophthora ramorum in Forests and Wildlands: This framework represents a combined national effort to outline a general plan to manage new finds of Phytophthora ramorum in forests and wildlands. Management Guidelines: Preventing spread in infected areas. Protecting Trees from Sudden Oak Death Before Infection: This publication provides helpful treatment information for areas not currently infested but at risk. Best Management Practices: Best Management Practices for a number of activities and user groups on wildlands and in urban-interface zones, for both homeowners and professionals such arborists. Survey Methods: General guidelines for conducting a survey to detect, delineate, or characterize Sudden Oak Death. Treatment and Management: This links to a page on this website that provides preventive measures that may protect plants as well as other management options. Sanitation: This links to a page on this website with sanitation measures to reduce the risk of spreading the pathogen. Spanish Fact Sheet: Basic facts about Sudden Oak Death written in Spanish. Oak Woodland Management: Information about the University of California’s Integrated Hardwood Range Management Program. Sudden Oak Death Information for Foresters: On the Best Management Practices page, find the latest guide to how to work in forests without unintentionally moving the pathogen from one area to another. SOD Update for Foresters & Landowners Part I: Background, Treatment, and Management: A series of presentations from Forestry Workshops in May 2010. SOD Update for Foresters & Landowners Part II: Forest Product Regulations and Other Forestry Issues: A series of presentations from Forestry Workshops in May 2010.